I sat inside a building, talking with a grieving colleague of a renowned forensic psychiatrist who had been killed just a few feet away the day before. She was upset, dealing with the death of her friend, but put on a strong face as she spoke. She recounted her fond memories and described his personality and grew quiet when she realized he wasn’t coming back. I struggled to remain neutral. Fast forward a few weeks. Sweat rolled down my back as I stood outside U.S. Sen. Jeff Flake’s office, jammed among a crowd of sweltering bodies on a summer day in Phoenix. Surrounding me were protesters and counterprotesters of the Trump administration’s “zero tolerance” immigration policy. Emotions on both sides ran high, and the heat wasn’t helping anyone’s mood – mine included. Working on the breaking news desk at The Arizona Republic this summer, I covered police shootings and car accidents and talked with emotional family and friends. In other politically charged events, passionate people on all sides of an issue came out to demonstrate and defend their beliefs. It’s draining, reporting these stories – and not only because of the heat. Hearing the same tragedies, repeated by different people, can be wearying. But taking time for myself to relax after my shift ended, whether that was reading fiction books tucked away in the corner of the library or grabbing a smoothie after spending a day in the sun, helped me reset. Separating personal life from work life is something I worked to balance throughout my internship. I carry the stories from grieving families with me, but they don’t crush me like they used to. Self-care and fulfillment outside work is as important as having a byline published at work. 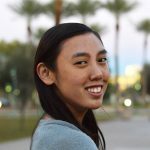 Kelsey Mo, a junior at Arizona State University, is a national political intern this semester at her CQS internship paper, The Arizona Republic.